Do you want to save on your cooling costs? If you've got a larger house, keeping all your rooms comfortable through the summer can be the biggest drain on your electricity bills. One way to beat the heat without breaking the bank is to install multi-head split system air conditioning – a single system to cool every room in your home. What are the advantages of using a multi head split system? 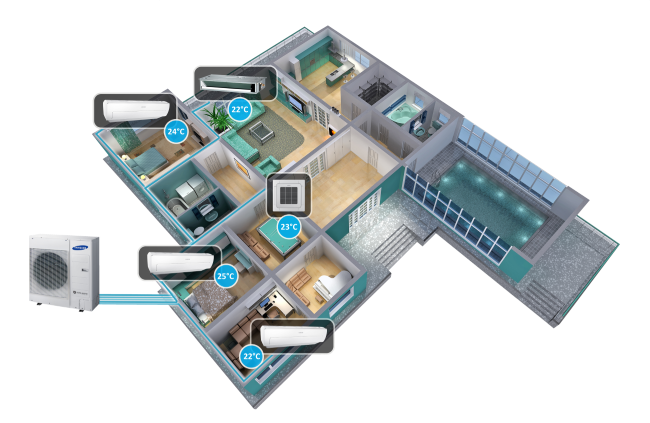 In a multi-split system, multiple indoor units ('heads') are connected to a single outdoor unit. Each of these indoor units can be controlled independently, so everyone in your family can create their perfect climate zone. Whether you need two, four, eight or more indoor units, Maxim installs multi-split system air conditioners in North Shore and Castle Hill in the Hills District of Sydney NSW and across Sydney. from reliable brands like Daikin, Actron Air, Mitsubishi Electric and Samsung. Individual control – Each unit operates independently, so you can set your desired temperature in every room. They're easy to operate using remote controls or automated timers. Accurate temperatures – Every indoor unit has its own temperature sensor, for more precise readings. This also means faster and more efficient cooling. Quiet operation – Fewer outdoor units means less noise outside your home. Indoor units are designed for whisper-quiet operation, making them suitable for sleep and study areas. Saving money – You only need to cool the areas you want to. We'll help you choose the right size heads for optimal cooling in each room. Saving space – You only need a single outdoor unit, which takes up less space and has less of an impact on your home's appearance than multiple systems. Cleaner air – Most split system air conditioners filter the air as well as cooling it. This removes dust, allergens and other impurities to improve the air quality inside your home. Low maintenance – Multi-split systems are easy to maintain. You just have to clean the filters regularly. The product will also be covered by a manufacturer's warranty. Split system air conditioners separate the indoor fan coil unit from the outdoor compressor, giving you more flexibility to choose where these components are located. Multi-head split systems are even more convenient, as they only require a single compressor to power as many indoor units as you need. These systems filter and recycle the air in the room, the air is then cooled as it passes over an evaporator coil and gets blown around the room by fans, heat removed from the internal space is then transferred outside the building through the outdoor condenser unit. If you choose a reverse cycle air conditioner, the cooling process can be put in reverse to provide energy-efficient heating in the winter. However, unlike other air conditioning systems, multiple indoor units may be connected to a single compressor to save space outside. A multi-head split system can also provide both cooling and heating if you choose a reverse cycle air conditioner. Multi-split systems take up less space than ducted systems, and they're also preferable if you have a flat roof or live in a humid climate. If your multi-head system has the capacity for more heads than you're currently using, these can be added later on as you need them. However, single-head split systems can't be converted into multi systems. What types of multi head split systems are available? Different rooms have different cooling requirements, and a multi-head system offers all the flexibility you need to maintain comfortable temperatures through your whole house. Depending on the type of compressor you choose, you can use wall-mounted, floor-standing, ceiling and bulkhead units in any combination. Depending on the model you choose, multi-head split systems can incorporate as few as two indoor units or more than 10 heads through the same compressor. The more heads you include, the more complex the installation will be, but you'll also be saving space and saving energy compared to installing separate split systems or ducted air conditioning. The most common option for Australian homes, wall-mounted air conditioners are designed to be unobtrusive and fit in with modern interior design. We'll help you choose the power output and size you need for the rooms you're cooling. Floor-standing units are also mounted on walls, but located closer to the ground, making them easier to access and maintain. They can be recessed into walls or installed in an empty fireplace to save space. If you want to save wall space, ceiling cassettes and suspended heads provide cooling from the centre of the room. This could be ideal for larger spaces, such as a lounge, dining room or open-plan apartment. The most discreet option, concealed heads can be recessed into a ceiling or floor where they won't be seen. With many models offering whisper-quiet operation, they won't be heard either. Want to know more about multi-head split systems in Sydney? Get in touch with Maxim to speak to our air conditioning specialists about split systems and other options. We can help you choose the best solution for your home.